Microsoft SharePoint Foundation 2010 and SharePoint Server 2010 provide a collection of tools and services you can use to improve user and team productivity, make information sharing more effective, and facilitate business decision–making processes. In order to get the most out of SharePoint 2010, you need to understand how to best use the capabilities to support your information management, collaboration, and business process management needs. This book is designed to provide you with the information you need to effectively use these tools. Whether you are using SharePoint as an intranet or business solution platform, you will learn how to use the resources (such as lists, libraries, and sites) and services (such as publishing, workflow, and policies) that make up these environments. Information and process owners will be given the knowledge they need to build and manage solutions. Information and process consumers will be given the knowledge they need to effectively use SharePoint resources. 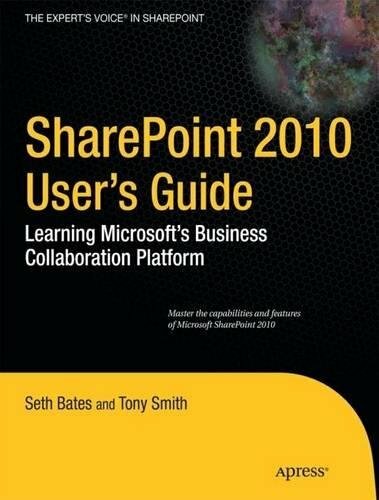 In this book, Seth Bates and Tony Smith walk you through the components and capabilities that make up a SharePoint 2010 environment. Their expertise shines as they provide step-by-step instructions for using and managing these elements, as well as recommendations for how to best leverage them. As a reader, you’ll then embrace two common SharePoint uses, document management and project information management, and walk through creating samples of these solutions, understanding the challenges these solutions are designed to address and the benefits they can provide. The authors have brought together this information based on their extensive experience working with these tools and with business users who effectively leverage these technologies within their organizations. These experiences were incorporated into the writing of this book to make it easy for you to gain the knowledge you need to make the most of the product.